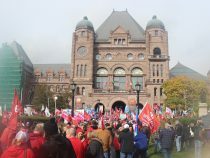 The Ontario government has finally unveiled their legislation that would repeal the gains workers made from Bill 148. In an emergency action coordinated by the $15 and Fairness campaign, 500 workers were out in the streets of Toronto yesterday evening, to send a message to Premier Ford that the actions he and his party have taken to repeal Bill 148 has betrayed workers across the province. Read more! Owen Toews is the author of Stolen City: Racial Capitalism and the Making of Winnipeg, published by ARP Books this year. He has a PhD in geography from the City University of New York and is currently a postdoctoral fellow at the University of Alberta. 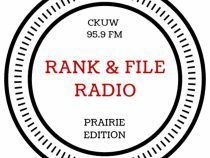 He is a member of the abolitionist prisoner solidarity group Bar None, which operates a ride share in Winnipeg for people to visit their loved ones in Stony Mountain, Headingley, and Milner Ridge. Born and raised in Winnipeg, he is descended from Russian Mennonites. Read more! Yesterday, four thousand workers, anti-poverty advocates, and retirees rallied in Toronto in support of maintaining a strong and accessible public healthcare system. The ‘Rebuild and Improve Public Health Care’ rally was hosted by the Ontario Health Coalition (OHC) and the Ontario Council of Hospital Unions (OCHU). It was organized in response to the expected cuts to healthcare and looming privatization likely to come from the Doug Ford government. Read more! Postal workers are on rotating strike. 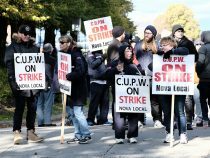 The reason postal workers are frustrated to the point of striking is because the Canadian Union of Postal Workers (CUPW) has been in negotiations with Canada Post since November 2017 with almost no progress at the negotiating table. In January, conciliators were appointed at the union’s request. In June, after 7 months of negotiations, the union asked the government to appoint conciliators, which started a countdown to a legal lockout or strike position on September 26. Read more!